Here in the west coast of Canada, fall is the rainy season. It often rains until the ground is saturated. This year fall began warm and sunny. The garden was deceived into a second chance at life and plants appeared healthier than their former state during the dry blistering summer. But the anticipated rain arrived and soon the robust dahlias bowed their heads in defeat. Yet despite the mournful demise of the garden, the sogginess of the backyard, and the incessant rain, autumn in Pacific northwest is to be celebrated for it is the pinnacle of growth and beauty in the temperate rain forest. There are many scrumptious little moments in the forest. Colours and smells of fall account of so much hidden under every decaying leaf. The maple leaves whose existence is unnoticed during the summer, are the most awe inspiring in the fall. 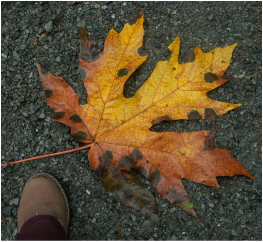 Weighed down with rain, these enormous decaying leaves are canvases of textures and colour. 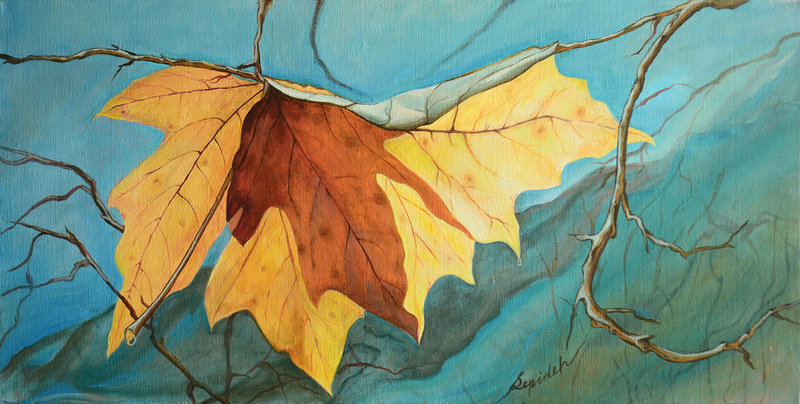 And when a lone leaf has a chance to shine in the autumn sun, one ought to snap a photo and paint the moment.